Vistors journeyed through a series of installations including a midnight rainbow, a flash of love, a visceral sound and light installation, and theatrical experiences. Admission: This was a free event. At first glance, the piece seemed like a simple video projection without sound in a dark space. A title appeared, followed by a 30-second countdown, and one quick flash left you with LOVE in your eyes. The word remained imprinted on the viewer’s retina, changing colour for several minutes. Wherever you looked, ‘LOVE’ was all around. Hideyuki Sawayanagi is an award winning Japanese artist known for his engaging light installations and incredible half-tone photographs, created by drilling hundreds of small holes at variable widths into sheets of aluminium. Hideyuki has a background in Economics as well as an MA in Fine Art from Goldsmiths College London. Inspired by the therapeutic effects of sound and light frequencies, Oscillate: Wave No.1 took you on a journey of well-being. Participants were placed in a cocoon of light where they were transported into a visual and aural trip of relaxation as the sonic waves washed over them. The Silvern Collective are an elusive group of enigmatic artists and musicians with a wealth of professional experience across the arts. Anonymity is essential for the group who keep their identities hidden to add to the mysterious dynamic of their work. Together the Silvern Collective have experience in the arts and music industry, working with Radiohead, Nick Cave, The Prodigy, Paul Weller, Spiritualised, and Metallica, amongst others. Amazing! Almost impossible to leave the Oscillate room. We are reborn. Louise Mansfield. Renowned installation artist Alistair McClymont created a spectral midnight rainbow for MERGE Bankside. 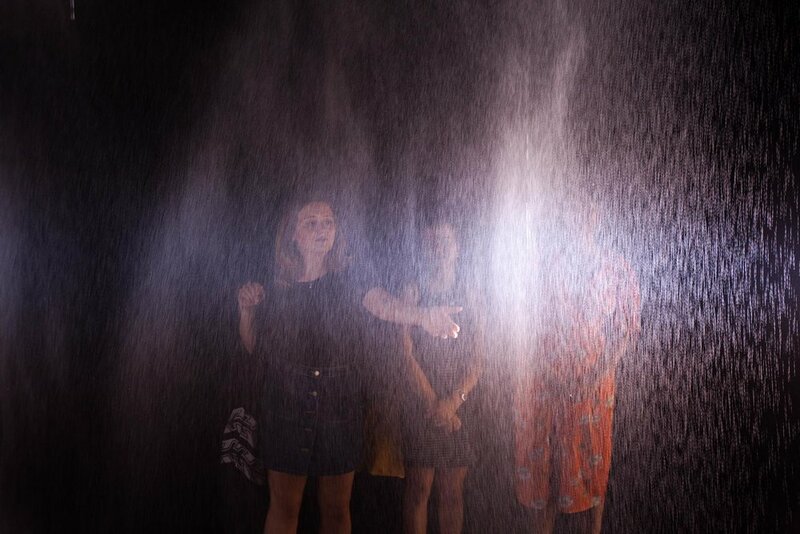 This interactive rainbow in a darkened room filled with ethereal mist allowed you to interpret things in a different light, as colours dispersed then reappeared as you moved through. Alistair McClymont often creates artworks through collaboration with scientists. He sees a close link with the way artists and scientists view the world. He has worked with meteorologists, a nuclear physicist, and at NASA’s Goddard Space Flight Centre in Washington using their ocean weather data and sunlight data. McClymont's previous work includes a 10ft high man-made tornado. For Merge, Sofi Lee-Henson was commissioned to produce a feel-good immersive theatre performance where 20 minute sessions were booked in advance for the Dr Leon’s Better Chip, the pinnacle of neural wellbeing treatments. A better life was just around the corner. The implanted happy chip encouraged positive behaviour to help patients discover their better self. The aim was to bring out the very best in you and gently eliminate negativity. Starring: Miranda Mac Letten, Fania Grioriou, Flavia Bertram, James Carney, Omar Gordon, and the voice of Rosemary Rance. Lighting Designer - Ben Kearney, Costume - Lauren Bridle Sound Recording - Irfan Hassan. Totally insane and worthwhile experience. Great Friday lunch break surprise. Thanks very much for doing this! Mark Leitner Murphy. Artists: Created by the cast from an original idea by Jinni Lyons and Katy Schutte, performed by Jinni Lyons, Helen Foster and Jonah Fazel. 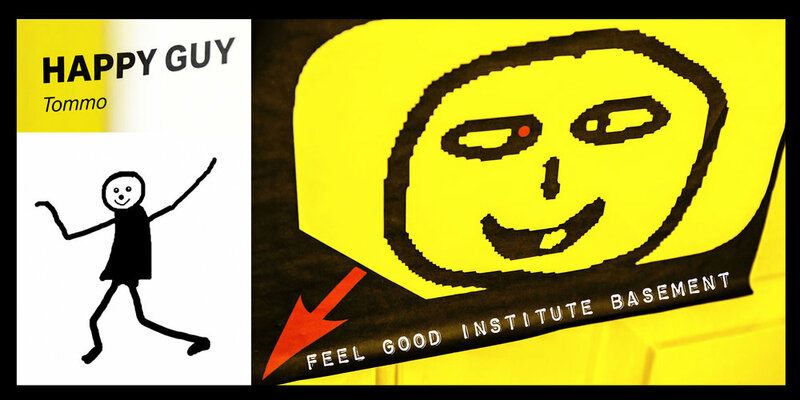 With the world in such a terrible state, the formerly secret Society of Nice was also a resident at The Feel Good Institute at unexpected times in order to recruit new members. Once you passed their rigorous training process, you was invited to be one of their agents. 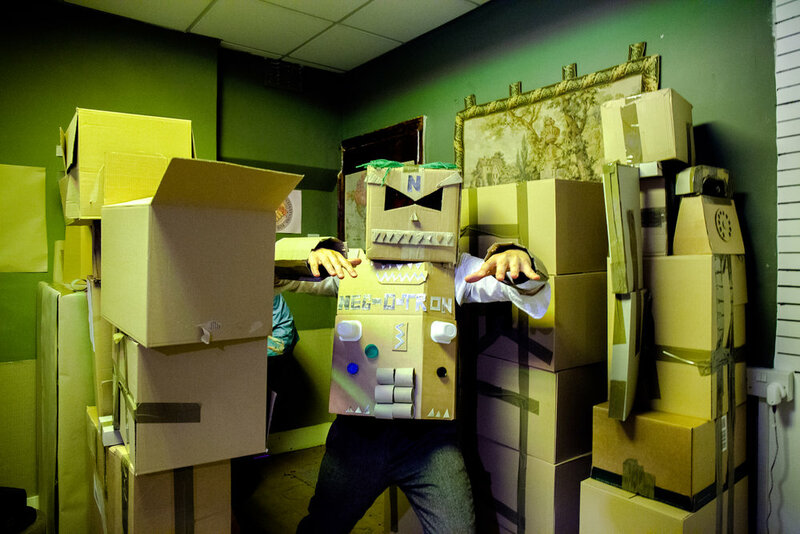 The Society Of Nice are a rotating collective of performers, directors, Improvisers and comedians with a shared loved of creative live theatre that plays with audience agency and immersive experience. The cast includes; Jonah Fazel - (BAFTA Winning History Bombs, CBeebies, Bumper Blyton Improvised Adventure); Jinni Lyons - (Jinni Lyons is an Only Child, Destination podcast, London and Liverpool Improvathons); Vicki Hawley- (Oxford Imps, Adventures of the improvised Sherlock Holmes); Toby Trimby - (The Flying Seagull Project, Craft Theatre, Bitesize Theatre, Wessex Actors Company). The most important business lunch for members of the public who lived and worked in the area took time out to throw some shapes and get those endorphins released. Just one hour of dancing left those who participated, feeling good for the rest of the day. Lunch Beat was all about playfulness, participation and community. Hosted by artist Tyler Moorehead. This was a ticketed event (included lunch). A special room to travel back in time to the 1988 Summer of Love with an interactive light and electronic music installation. The hedonism and rebellion of the times were recalled with a collection of photos throughout the space, while the music stimulating you to dance your heart out to celebrate the 30th anniversary. The three brands most synonymous with this era - Gio Goi, Roland, and Smiley - joined forces with YOUTH CLUB Archive at MERGE Bankside to co-curate a series of events that paid homage to this unforgettable era and spreading these collective memories to partygoers today. There was also a premiere screening of “They Call it Acid” by the Donnelly Brothers and a live event that was hosted at Omeara. Theatrical laughter sessions with a twist… These comedic interactive workshops allow you to ‘reclaim your face’ when smiling becomes too much. Laughter has been used as a therapeutic tool for many years; a contagious and universal emotion that brings people together and breaks down barriers. It relieves stress, relaxes the body and releases endorphins. Come and experience a laughter workshop our way in the Feel Good Institute. Tommo is a London based photographer, film-maker and artist and has worked with many clients in Portraiture, Documentary Arts, Fashion and Music along with an extensive array of personal work. 'Happy Guy' is written, sung, played, and drawn by Tommo as part of his humorous roster of videos. His new video project is a sarcastic take on cooking, entitled ‘Credit Munch’. Videos for which are gradually being uploaded to the new ‘Credit Munch’ YouTube channel. The Credit Munch Book was also featured on Channel 5's 'The Wright Stuff'. 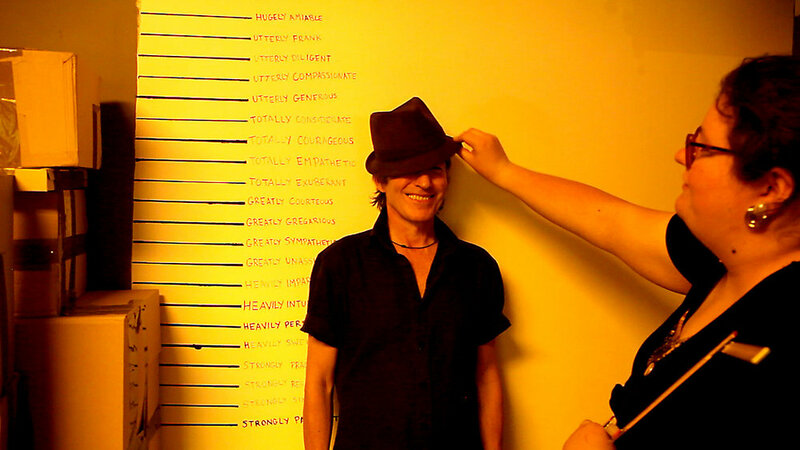 Tommo also sings and plays bass in the Band ‘Mouse’ (mouseband.bandcamp.com) and films most of the bands video too. which can be viewed via Mousebanduk on Youtube. Millions of sensory receptors in the mouth work in tandem with the brain to alert you to the nature of what you’re about to consume - which could potentially place you in danger. Danger excites the brain. Bompas & Parr explore healthy body frequencies and the elusive and mysterious wormwood herb. 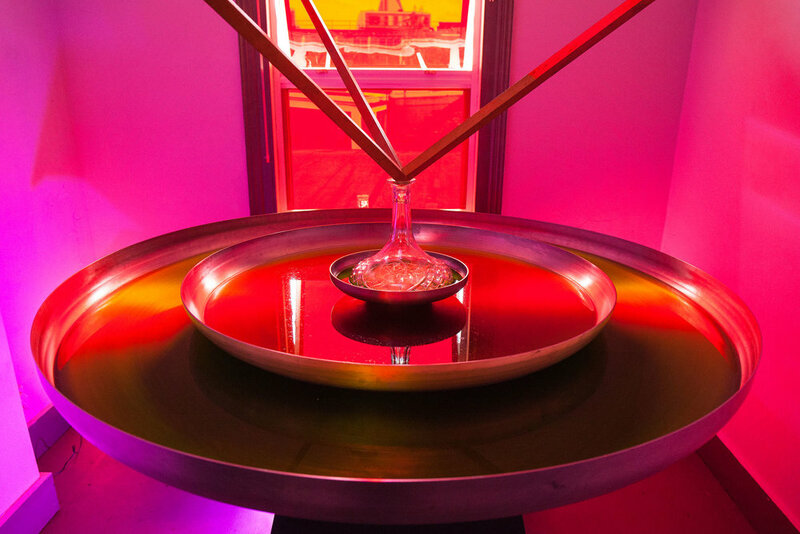 Wormwood, burdock and birch sap shooters will be served from Bompas & Parr’s Chaldni Punchbowl which emits a 25Hz frequency throughout, enabling guests to visualise the frequency of their drink.